After Dark's Horrorfest 2007 & Boxing." Sufficed to say, we were not disappointed by this year's offerings from the people at After Dark who put on this horror festival. From aliens to Santerian Drug Lords, from kill-crazy inbred B&B owners to easily provoked cannibalistic mutants, we took it all in. Each viewing was followed by shared guffaws out in the parking lot between my brother and I, and bets on how many people would be joining us in the theater for the next movie (and, for the record, the high and low was met on the first night, as Unearthed drew a grand total of SIX people for the 6pm viewing, while the following 8pm slot, The Deaths of Ian Stone, was attended by at least 2 dozen folks... word of mouth? I dunno...). As fate would have it, one of the movies from our second night at the festival, Mulberry Street, had the slightest link to boxing, so I felt it was my duty to write up a little examination of the film, fulfilling both the requirements for the site while giving me a chance to drum up just the faintest amount of praise for what was almost a uniformly bad (in the best way) weekend of cinema going. Turns out, this was my favorite film of the festival. The link to boxing is in the form of our main protagonist, Clutch (Damici), who happens to be an ex-boxer. At least, I think he's given pugilism up as a means of employment. He's a little long in the tooth to be duking it out to make ends meet, but he still seems to be in some form of training, doing a decent amount of early morning roadwork. Plus, I don't recall him mentioning any other means of paying the bills. The 7-floor walk-up he rents might be rat-infested, but it's Manhattan for crissakes! How's he affording this place? Maybe it's the same rent-controlled joint that the cast from "Friends" was living in for 10 seasons? Regardless, it's the rats we're interested in. "Something" (and I mean that in the least explanatory way possible) is infecting the rats, making them bite-y, and, in turn infecting those that get bitten by said rats. At first, as we see from the perspective of the Clutch's building super, it presents itself as a low-grade fever and a hunger for meat. But pretty soon, as we see from news flashes on the tenants' televisions, the rats are getting very aggressive and the symptoms for those bitten become more dire. Bottom line: I'm talking about zombified were-rat people. Before you know it, the bitten are becoming totally detached from their former personalities (a la Danny Boyle's 28 Days Later and his insistently non-zombie-zombies), blood-thirsty, and, I kid you not, they start sprouting snouts, whiskers, and pronounced rodent incisors. Perhaps the "were-" prefix is unwarranted, as the change isn't brought on by the moon and doesn't appear to be transitory by any means (as in the bitten stay infected, with no hope of "changing back"). Anyway, despite being warned to "stay indoors", Clutch soon is moved to head out into the now Rattus sapien infested island to find his soldier daughter (Blair), returning from Iraq, and a woman from his building named Kay (Corre), who Clutch shares a mutual flirtation/attraction thing with. While there's plenty to laugh about here (both intentionally and unintentionally, including what Clutch decides to arm himself with when heading out into the dangerous Manhattan streets, which I'll get to later in the Fightin' section), everything is taken pretty much on the level in regards to tenor and plot. The urge to play up rat-tendencies in people and how that could be exploited (what, no giant block of cheddar in a snap trap as a deus ex machina?) is handled with a light touch, and we get a pretty tense (if derivative) chase-and-get-back-to-the-barricaded-apartment zombie exercise. I have to give credit to the writers and actors for creating some people you actually cared about and hoped didn't get turned into were-rats. It was, by a long mile, the best acted of the movies I saw at the festival. On the bad side, it also suffered from the most blatant overuse of shaky-cam for the entire festival (and that's saying something with the nearly unwatchable, dramamine-worthy Unearthed in the line-up). One could argue that this was a necessity, so we didn't get too good a look at the were-rat make-up, but after a while I just had to close my eyes and listen to the non-action, talking scenes, which is unfortunate. Something for Director Jim Mickle and cinematographer Ryan Samul to think about for their next features (or perhaps these were post-production shakes, so my comments are directed solely at Mickle who pulled triple-duty as director, editor, and co-writer along with the movie's star Damici). There's enough talent and promise shown here to hope for bigger and better things in the future for all involved. I was recently reading on a movie message board I frequent about the armory of weapons many have amassed in the event of a zombie attack. The board members were debating the effectiveness of certain munitions (such is the minutiae of our nerdliness) and one of my friends mentioned the uselessness of his judo training in the event of the zomb-pocalypse, what with all the nipping and clawing and brain devouring. The effects of a zombie bite have been well documented in movie history, so hand-to-hand combat is a definite no-no. And this movie was no different. They actually say, flat out, that the "disease" is spread by the transfusion of bodily fluids. So what does Clutch do? He wraps up his mitts and goes out punching zombiefied were-rats! To hell with a gun! Or even a decent sized stick! Hell, I'd be happy with even an old pair of boxing gloves. But no... let's get within an arm's length of these slobbering, biting monstrosities and pray no cuts show up on our cloth-wrapped knuckles! It's ill advised on his part, but, admittedly, fun to watch Clutch running pell-mell into the night, clocking the bad guys. So minus 6 points for common sense, but plus 4 for good ol' fashioned goofy fun. I realize that saying this movie was the best of Horrorfest 2007 is akin to handing out the valedictorian honors at Summer School. The competition was about as stiff as boiled celery. But I do want to give credit where credit is due. 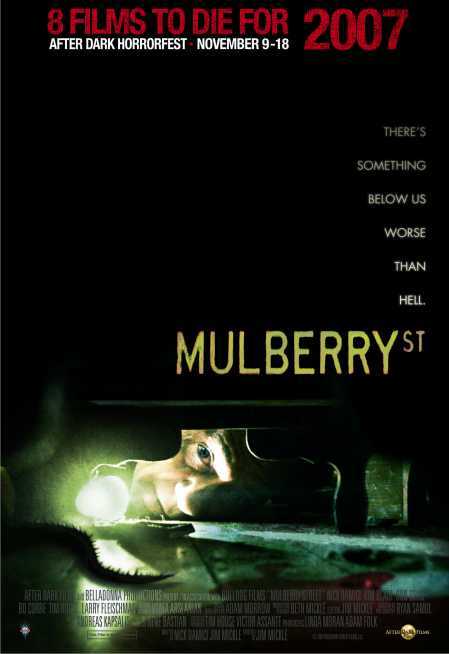 Mulberry Street was passable for a horror movie. There were enough visceral thrills, acting ability, and originality in the use of rat-based traits for the infected masses (I loved that one trapped were-rat gnawed and clawed his way through the drywall and into the walls to make his escape) that I could recommend it. Yes, this particular horror oeuvre has been very well mined lately (and the ending is a straight lift from the grandaddy of all zombie flicks), but there was plenty to like along the way. Would I run out and buy a copy? Probably not. Would I put it in my Netflix queue in anticipation of a b-movie horror night? Definitely. I'm breaking out the very rare "� a count" because I saw something at work here (that is, when the camera would stop shaking) that tells me we can (hopefully) expect better from this group of filmmakers and actors in the future. I hope they stay firmly in this genre and don't go gettin' all respectable like. P.S. - And a very special thanks to my brother, Mike, for buying me a ticket to this dubious event and suffering through it along with me (and, for the record, his favorite of the festival was Lake Dead, so make of that what you will...) Thanks Mike.